For companies that produce copious amounts of valuable recyclable waste, purchasing a baler or compactor should be a no-brainer. Why? Well, take the example of a cardboard baler, which makes an 800- to 1,000-pound bale. If recycled cardboard is going for $110 a ton, every bale is worth about $45 to $55. A retail store can easily produce four to six bales a day. So, in some cases, balers have a return on investment of three to four months. And then they become a profit center. Learn more about the benefits of balers and compactors below. On the waste-compaction side, a compactor usually has a 4:1 reduction ratio. Recycled shrink wrap ranges in value from $600 to $700 a ton. Polyethylene terephthalate, or PET bottles (such as soft drink bottles), bring in roughly $500 per ton. And aluminum can earn you about $1,200 to $1,300 a ton. It may be difficult to convince your purchasing director to buy a piece of equipment that will run you anywhere from $12,000 to $18,000. But, depending on how many bales you produce on a regular basis, the machine will definitely turn that around and create a revenue stream that would have been nonexistent otherwise, explains Joe Perillo, senior director of supply chain operations and lean enterprise for PTR Baler & Compactor. Security: You limit shrinkage versus a dumpster, because employees can’t put things in a sealed compactor and then pick them up after business hours. Savings: A hauler may charge $200 to $300 every time they pull a container. So, if you’re using an open-top dumpster and getting four pulls a month, with a compactor you’ll pull only once a month. Revenue: Not only do you reduce the number of pulls or pickups, but also you take the product that comes out of the machine and sell it. 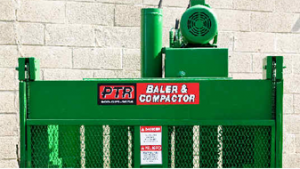 Outsource Equipment Company client PTR Baler & Compactor offers new and used PTR balers and compactors, and services their machines as well as their competitors’ products. “We’re striving to be the supplier of choice, as well as be a one-stop shop for our customers,” says Perillo. PTR can provide the right equipment – at the right price – for you. And when you talk to them, tell them you heard about them from Outsource Equipment Company.